This week South Bank in Brisbane launched an online campaign to promote the parklands and what it offers. The campaign offers a competition with enewsletter subscription options and refer-a-friend functionality. 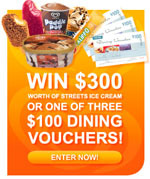 Visitors can win a Freezer full of ice cream from Streets or dining vouchers. To enter, visit South Bank’s website. This entry was posted on Monday, December 18th, 2006 at 8:35 am and is filed under Campaigns. You can follow any responses to this entry through the RSS 2.0 feed. Both comments and pings are currently closed.